Comprehensive expertise in a range of surgeries spanning from coronary artery bypass grafting (CABG) including on-pump CABG and off-pump CABG, mitral valve repair of ischemic mitral regurgitation, redo CABG operations with a successes rate of 99.8%. Conducted first Indian survey on use of “Bilateral Internal Mammary Artery Grafting during CABG in India” and presented at AATS International Coronary Congress, New York 2015. 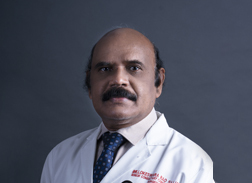 Delivered - Dr.C.S.Sadasivan Memorial Oration at 60th Annual Conference of Indian Association of Cardiovascular-Thoracic Surgeons held at Kovalam, Trivandrum (2014).